This induction speaker has larger than life sound that works by turning almost anything you place it on into a speaker. Put it on top of any hard surface such as your countertop, desk, cooler, a cardboard box or picnic table for a high output experience you just won't believe is coming from such a small speaker. 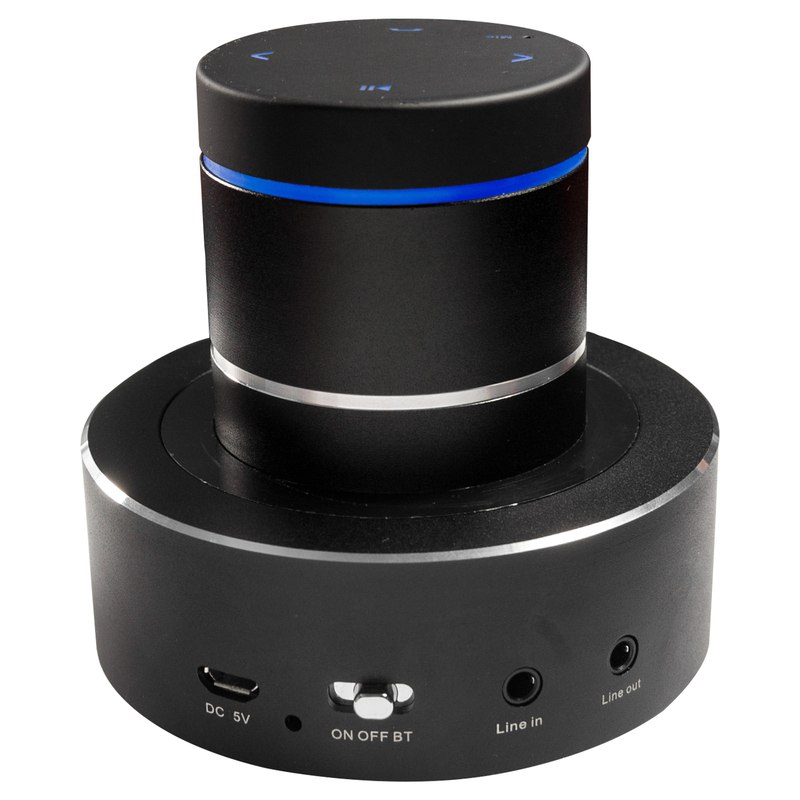 This innovative Bluetooth 4.0 vibrating induction speaker delivers 360 degrees of omnidirectional sound. You can play your music via any Bluetooth audio source or the built-in 3.5mm stereo jack. It is perfect for smartphones, tablets, MP3 players and more! Pair your NFC capable devices effortlessly by tapping your NFC capable tablet or phone on the top of the speaker. You can even use it as a hands-free speakerphone. It has a built-in rechargeable battery for 2-3 hours of cordless music playback. With 26 watts of powerful audio with super bass, your music will be loud and crystal clear. Really fast (international) shipping. Sales department reacted very quick on my emails (I had some issues with ordering). The product looks as I had expected on basis of the pictures. It took me some time to get bluetooth operational with my laptop (Had to update my bluetooth drivers on the laptop to get it working properly). I did not test NFC option, since this is not supported on any of my devices. The product has really nice sound. Although it is not as powerful as I expected, it is powerful enough to produce room-filling music. Frequency range goes down to 40 Hz approximately. I did not test the battery capacity yet, since it's still running at it's first charge. What's unclear for me at this moment is if there is a empty battery indicator on the device. The volume control on the device is somewhat slow, so controlling volume is easier done using laptop/phone. Directions were bad & sound was terrible. I think the best sound comes from a large piece of glass on a desk or my front window. Have to figure out how to keep this on the window without it falling down. It seems to be manufactured from sturdy materials and syncing to Bluetooth was easy. I recommend this to anyone that loves technology. A really neat and useful product. It's fun to experiment and find the location/surface which will generate ideal quality and volume of sounds. The included audio cable had a short, which is not typical of CableWholesale's cable quality. CableWholesale Response: I'm sorry your cable had a short. I'll have a replacement shipped right away. CableWholesale Response: I'm sorry you aren't happy with our vibrating induction speaker. A prepaid return label was sent to you to return this to us. "Great product", "You won't be disappointed". Ok, I was really doubting this, but it seemed like it might be cool. This is a total geek gadget. I showed my friends it, setting it on tables, file cabinets, boxes, and all kinds of hard surfaces and it impressed them all. 3 of them ordered it on the spot. My kids love it. And it's so easy to use. I have used it with my laptop, with my phone - playing movies and music, as well as with my phone playing music and as a conference call device. Pretty darn cool! The speaker sound is of great quality when placed on a wooden surface. Does not do well on a granite countertop such as in kitchen. The charging information was sorely lacking. Found that after the first charge the unit played for over 6 hours.Made Bluetooth connection to my iphone without a problem. Charges on a DC 5 volt electrical connection well that has usb port. ( not included in package) The blue lights on top and the red or blue ring around the unit are too bright and may be annoying. Easier to change the song and the volume from the base unit then it is from the speaker unit.Calls come in loud and clear without distortion. Did not check to see how far away from the speaker the microphone would pick up so can't review. This thing is pretty cool. we are using for music, phone calls, etc. putting it on a desk is the best to get high quality sound. Have had it for a day, but everyone in the office wants one. Instant speakerphone, portable music, etc. BUY IT!!! I love it, excellent sound, love the change of sound, on different surfaces. I love it! Turns my work desk into a speaker that i can takj phone calls on. A quality product. The sound is really decent. The instructions are really poor.